With the White Wave Interlocking Glass/Metal/Stone Blend Mosaic Wall Tile, it's easy to add a splash of contemporary styling to your decor. This attractive tile features a seemingly random arrangement of crystallized glass, brushed metal and natural marble tile strips on a 12 inch x 12 inch mesh sheet that makes installation a much easier process. With elegant white tones, this tile creates a distinct pattern. Ideal for use on interior and exterior walls, the mosaic has infinite applications to complement a variety of installs. Get the MSI Stone ULC Tuscany Ivory Honed Travertine Mosaic Wall Tile for your next installation or renovation project to incorporate a contemporary aesthetic into your decor. This attractive mosaic features arched strips of 1 in. x 2 in. tile arranged in a herringbone pattern on a 12 in. x 12 in. mesh sheet that makes installation a much easier process. Its random variations in tone create a stylish complement for a wide variety of design schemes. This highly skid-resistant tile is constructed from durable travertine material and features a semi-vitreous water absorption rating. Natural stone products inherently lack uniformity and are subject to variation in colour, shade, finish, etc. It is recommended to blend tiles from different boxes when installing. Natural stones may be characterized by dry seams and pits that are often filled. The filling can work its way out and it may be necessary to refill these voids as part of a normal maintenance procedure. All natural stone products should be sealed with a penetrating sealer. After installation, vendor disclaims any liabilities. Alaska Gray River Stone 12 inch x 12 inch Mesh-Mounted Mosaic is a Natural Stone Marble. This tile has random pieces of flat polished rock mounted on a 12 inch x 12 inch mesh sheet for ease of installation. A blend of various shades of gray makes it an attractive option to complement any install in a wide variety of design schemes, including kitchens and bathrooms. Note: Inspect all tiles before installation. Natural stone products inherently lack uniformity and are subject to variation in colour, shade, finish, etc. It is recommended to blend tiles from different boxes when installing. Natural stones may be characterized by dry seams and pits that are often filled. The filling can work its way out and it may be necessary to refill these voids as part of a normal maintenance procedure. All natural stone products should be sealed with a penetrating sealer. Black/White Pebbles Mosaic is a natural stone 12-inch x 12-inch marble mosaic that is used extensively to complement bathrooms, showers, backsplashes, flooring and fireplaces in a combination of designs creating unique looks. Make a statement by adding your creative touch using these decor items. NOTE: Inspect all tiles before installation. Natural stone products inherently lack uniformity and are subject to variation in colour, shade, finish, etc. It is recommended to blend tiles from different boxes when installing. Natural stones may be characterized by dry seams and pits that are often filled. The filling can work its way out and it may be necessary to refill these voids as part of a normal maintenance procedure. All natural stone products should be sealed with a penetrating sealer. After installation, vendor disclaims any liabilities. With its unglazed finish, the MS International Inc. Emperador Blend Bamboo 12-inch x 12-inch Brown Marble Mesh-Mounted Mosaic Tile makes an understated but stylish impact on your walls. Designed for indoor use, this natural stone wall tile has water absorption of less than 0.5% and is certified by the Marble Institute of America. 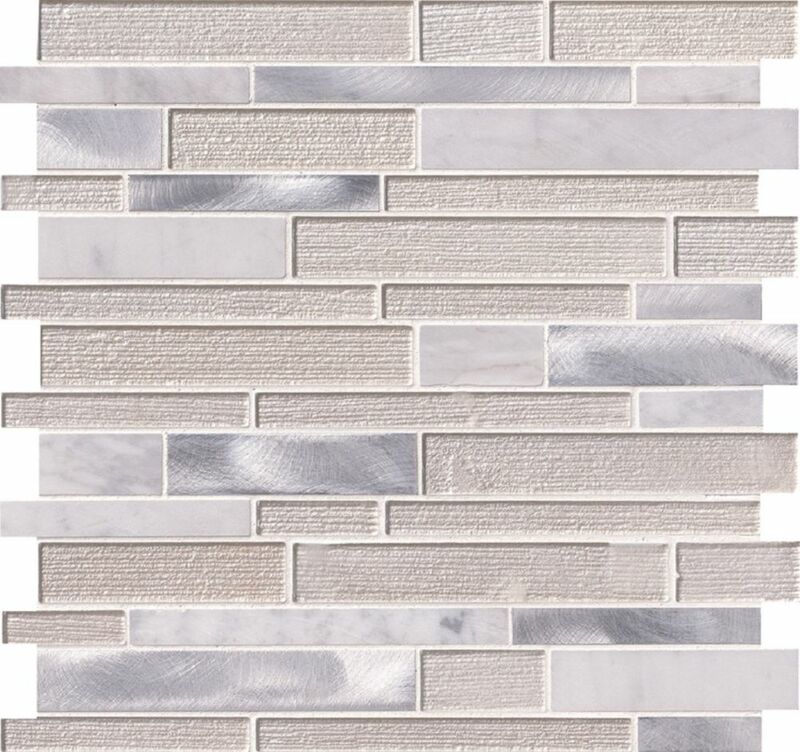 White Wave 12-inch x 12-inch x 4 mm Glass/Stone/Metal Mesh-Mounted Interlocking Mosaic Tile With the White Wave Interlocking Glass/Metal/Stone Blend Mosaic Wall Tile, it's easy to add a splash of contemporary styling to your decor. This attractive tile features a seemingly random arrangement of crystallized glass, brushed metal and natural marble tile strips on a 12 inch x 12 inch mesh sheet that makes installation a much easier process. With elegant white tones, this tile creates a distinct pattern. Ideal for use on interior and exterior walls, the mosaic has infinite applications to complement a variety of installs. White Wave 12-inch x 12-inch x 4 mm Glass/Stone/Metal Mesh-Mounted Interlocking Mosaic Tile is rated 4.6 out of 5 by 25. Rated 5 out of 5 by Linzizee from Looks great and also neutral colors to go with white... Looks great and also neutral colors to go with white ,grays and beige units. Rated 4 out of 5 by Tik from We were using this tile as a design feature in... We were using this tile as a design feature in our bathroom behind the sinks between the two mirrors. It was a bit tricky because of the need to be grouted but it looks good. If we could have found a similar tile that was peel and stick that may have worked better for this project. Rated 5 out of 5 by AnnieLou from Looks beautiful in our new kitchen! Reasonably priced and picks... Looks beautiful in our new kitchen! Reasonably priced and picks up the colors of our cabinets and granite. We also like the way it looks ne t to stainless appliances! Rated 5 out of 5 by Suzanne from Beautiful! Really blended well with my cabinets and kitchen. Very... Beautiful! Really blended well with my cabinets and kitchen. Very light weight.